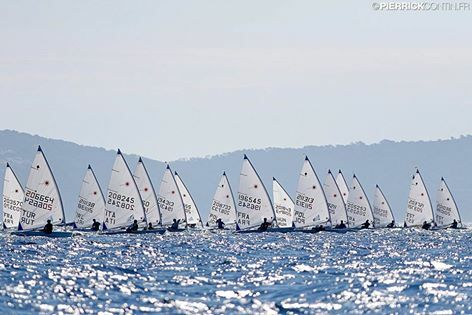 The perfect conditions with sun and a 15-18 kn breeze, the freshest one so far, stayed on yesterday on Hyères Bay, and all three classes completed three races each. Jean-Baptiste Bernaz FRA confirmed his role as favorite in the Lasers Standard winning all three heats. Duko Bos CRO advanced on rank 2, Antony Munos FRA is now 3rd. 93 participants. Maud Jayet SUI defended her overall lead in the Lasers Radial, but the two best of the day Hannah Anderssohn GER (1/1/1) and Marie Barrué FRA (1/1/2) reduced their backlogs considerably. 233 participants. A Swiss lead also in the Lasers 4.7 with Félix Baudet SUI. With two 2nd ranks, he is now one point ahead of Mattis Pacaud FRA and Andrea Crisi ITA.